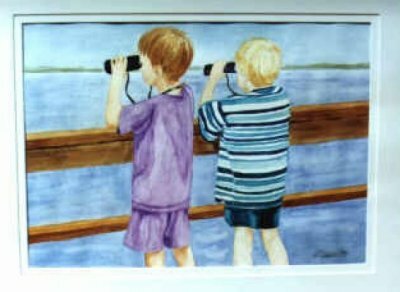 This is our tow-headed grandson, Connor, with his cousin, Jordy, looking for 'neat stuff' on the lake at the cottage. He was at another Grandma's cottage, but I took a bit of liberty, as artists are wont to do. The painting is called "Do you see what I see? ", and it hangs in Connor's home.